Concern had just completed a huge three-day government food distribution to 5,000 people from the 67 surrounding villages. Tonnes of maize, soya and groundnut seeds had been given out – enough to grow more than 600 acres of fields. Mr Jamu was amazed when we arrived in the early evening, especially when we said we were hoping to stay. “You are very welcome.” He sat in the evening sun, his back against a mud wall, surrounded by children. “Yes, it’s been a difficult year. But now we are all in good spirits. 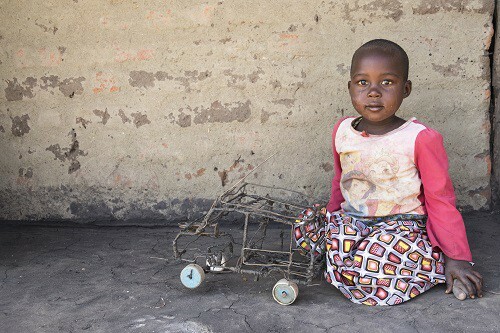 As of today it is better, there is hope.” Slowly, Gumbi opened up, and the traditional Malawian reserve to strangers and whites in particular started to thaw. We walked around our new home. Seven men played bawo, a game that involves moving tree seeds from one depression in the earth to another. 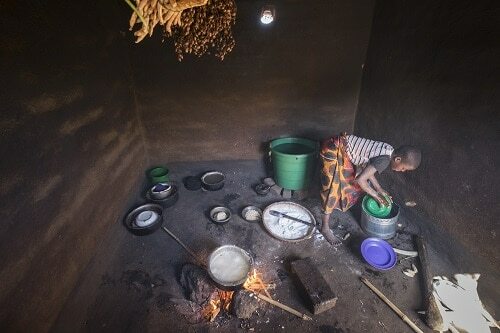 Outside the huts, groups of women were cooking. “This is a fine village, but you must know it is full of secrets,” said Francis. “We have secret police, secrets for women and secret groups of men. Some things are not secrets but are done in secret. Listen” he said. That evening, the rice was cooked on a small wood fire and the chief’s nephew killed a chicken. All round the village, households were enjoying their first good meal in months. The staple food, seema, is a heavy, tasteless maize pudding, eaten with the fingers. In good times it’s served with a relish of vegetables or meat. But it’s ideal food for hungry people, filling the stomach with bulk. Everyone prefers rice but in Gumbi it usually appears only on Christmas day. Our carrots and potatoes were rejected and the beer disappeared. With the drink and the starlight it might have seemed Gumbi’s problems were forgotten, but an an old man tugged my shoulder. “Food. Food,” he said. His eyes were wild. We were led to a hut by the tipsy son of the chief and a couple of his chums. It was empty except for a black chicken, tied by a piece of string round its leg to a wall. Outside, the drums and the voices of the gulewamkulu men rose in a crescendo. The women were still singing, too. “Tomorrow you will see the nyao,” said the chief’s son. Was he one? He laughed. Probably. The next day we got the full Gumbi tour. It could well be the poorest village in the world. The 600-odd people have no electricity, running water, telephone, television, shop, cutlery, pictures. Few people have shoes. There are six or seven radios in the village, but most have no batteries. 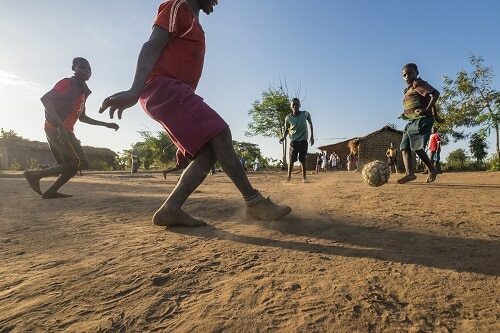 The boys had made a football out of scrunched up plastic bags tied with string but, without a decent ball, other villages won’t play matches with them. A few people have bicycles and there is one ox cart. There are three wells, but one is not for drinking. Last year they had three cases of cholera, and almost everyone had malaria. “We have been on the edge of life for a long time. I will eat one bowl of porridge today. It keeps me alive, but it’s not enough. It’s the very, very poor who have suffered. Here there are no rich people but there are many people with nothing. Maybe we live, maybe we die,” said Lucy. “The food handout was not fair. It wasn’t 41 families who got the food in Gumbi, it was just 16. The chief made the list and he put his friends on it. The strong get the food. The chief chooses the wrong people. The village is meant to help choose the list of who is most in need,” said another. “Gumbi is only famous for having nothing,” said Verida. 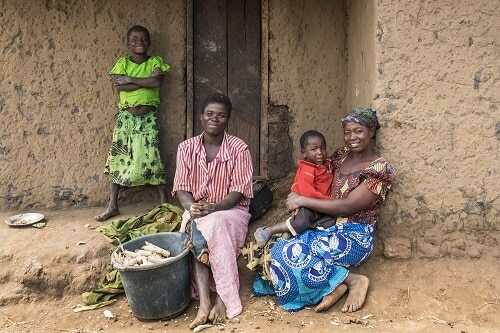 “Perhaps we are famous in Malawi for having the most numbers of deaths from malnutrition!””It’s famous for its dancing,” said Likisinia.”Yes, and I am famous because my husband left me,” said Bernadetta. There were squeals of laughter from the other women. “But that was 10 years ago,” said Lucy. “But it’s very difficult for a woman on her own!” replied Bernadetta, and she laughed and laughed. One hour later, more than 250 people met under the village trees. 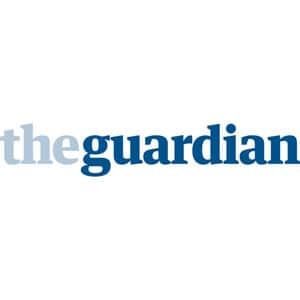 A misunderstanding had grown that the Guardian was a government or at least an international charity and would bring the village “a project” to benefit everyone. One by one the men stood up and addressed us. “This hunger is unforgettable/whereby the old ones, the young ones/all of us are malnourished,” it went. Strangely, it wasn’t sad. More a statement of fact. Many of the children still wore the hospital wristband identifying them as having recently been severely malnourished. Many had curiously old faces, and one, no more than seven, had the deep voice of a full-grown man. The great drum was rolled away and, from the other side of the village, 50 women, some thrashing a stretched goatskin with a stick, came stomping in. Their song built from deep in their empty bellies. They sang of their ancestry, of the time when they were nomads, “crossing rivers and moving day and night across the land”. Then the men joined in and they become a ragged band of 100 of the poorest people on earth. Their heels were cracked like the soil, their toes splayed. Some held their hoes, others had their trousers held up with safety pins, all were in shreds. Together they sang: “All will be right/I am going to die/ no problems/You are my child/All will be well.” It was a slow, haunting song, not remotely accusatory. And then, out of nowhere came the secret dance society of the nyao. Several men dressed head to toe in the sisal sacking used for food aid, covered in mud, some with knives, hurled themselves on the ground, cried and leapt like animals. The children were scared and ran screaming to their mothers, who sheltered them in their arms. 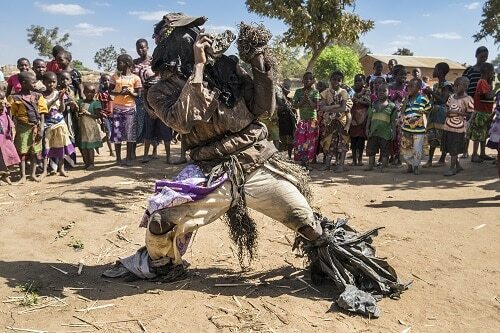 Malawi may be one of the most Christianised countries in Africa, but this ancient pagan spirit dance is as strong as ever in Gumbi. We met Justin at the edge of the village. “It’s been a difficult time,” he said. “I didn’t get any food from Concern because when the list was made up I was ill. Now I have prepared my land but I have no seeds. Most people have little or no food now. They borrow, they live from hand to mouth,” he said. I left them promising I would try to help. “Everything now depends on the rains coming,” said Sister Modesta. In May, almost a year to the day after the first visit, I return to Malawi for the fourth and last time. I find Sister Modesta in Nambuma far more cheerful. American food aid is at last getting through, but the very poor are still in trouble. More than 2,000 people from the 67 villages around the feeding centre, she says, are still clinically malnourished. But the harvest looks good, for the first time in two years. Word has reached Gumbi within minutes of my arriving at Nambuma and the chief meets me on the road to the village. He is hardly recognisable. Instead of the downcast, defeated peasant farmer of last year, there is an upright, beaming – if barefoot and raggedy clothed – man who looks six inches taller and 10 years younger. “We are better. We have food,” he says. Back in Gumbi, he tells what has happened. The rains came just after I left in December and the farmers had managed to plant crops with the seeds provided by Concern. 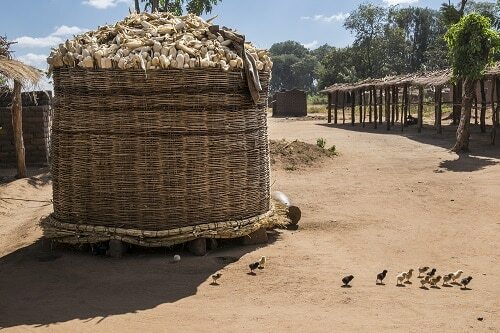 Elsewhere in Malawi there had been floods and thousands had lost their crops, but Gumbi, the unlucky village, had escaped. Now the village is expecting a reasonable harvest. Any day now, he would give the signal and the whole village would head for the fields to gather the crops. The village itself looks different. Outside every house is a large compost heap. “We have learned we must not be too dependent on fertiliser. We are learning what we can do for ourselves,” says one man. We head to the edge of Gumbi where a seasonal river trickles through a large wetland. In the past few months more than 60 people have constructed a paddyfield, and now an acre of rice is growing. It will be shared between those who worked the land and the neediest in the village, says Kennedy. The plan is to construct a small earth dam across the river and eventually turn the whole area of more than 100 acres into a place where winter crops could be grown communally with five other villages. Concern had just completed a huge three-day government food distribution to 5,000 people from the 67 surrounding villages. Tonnes of maize, soya and groundnut seeds had been given out - enough to grow more than 600 acres of fields. "Now it only needs the rains, expected in the next two weeks. People are very optimistic," said Stephen John Tsoka of Concern. 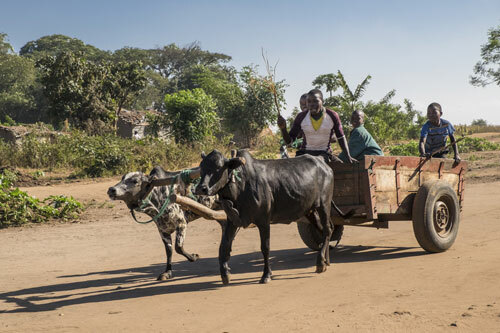 "This is like Christmas," said Forster, a young Malawian sat on a 50kg sack of maize, with a bag of seeds and precious fertiliser at his feet. "Just two hours ago everyone was dancing. We are very happy."